This is actually one of my favorite games for teaching systematic problem solving! (Not only do you have to remember things well, but the best player has a system that helps with memory, such as always starting in the top left, and working your way across – which helps you remember where you last saw that photo of the dog when you flip up its match.) I think every kid should have play the game, and Shutterfly makes it possible for you to choose photos that have the most meaning for your child for less than $20… about the same it would cost to buy a commercial Matching Game . For the holidays, I’ll be making a set for my mom (she has Alzheimers and fine motor challenges, so the game offers some physical rehab potential as well as a memory refresher about the faces and names of her loved ones). For my son, who is about to turn seven, I will make two sets with matching backs, so that he has a total of 48 cards. That way, when we start playing the memory game with him, we can start with just 4 to 6 pairs and as he gets better, we can make it more challenging by adding up to 24 pairs! Under the tab “Gifts”, under the category “Gifts for Kids”, you’ll see “Memory Games.” Click on that. Now, choose the design you like best, and click on that. 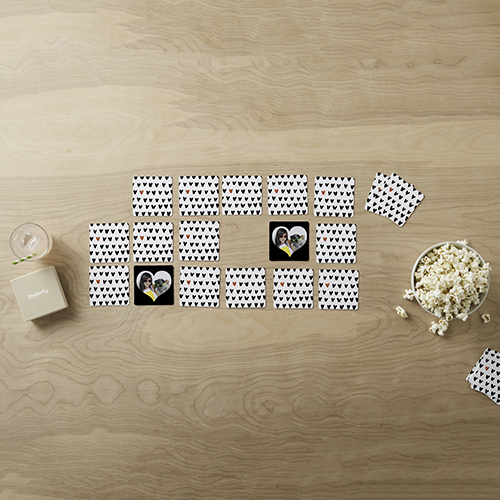 Click on each card to customize. You’ll upload the photo you want, then edit as you want. You will design 12 cards. They will print two copies of each for 24 total. In choosing photos of people, a headshot of a single person will work better than full body shots, or group photos, just because the final cards are just 3 x 3 inches, so the final image is fairly small, especially if you chose a design with a big border. When you’re done with the design, place your order! Shutterfly also has other great products: One year, we made a wall calendar for both sets of grandparents featuring lots of artwork by our kids. Another year, we made an 8×8 photo book that was a personalized alphabet book. The “A” page had a picture of Uncle Alan, our friend Adam, our child holding an apple, and so on. Looking for more holiday gift ideas? Click here for thoughts on choosing the best toys for your child. This entry was posted in Play and Fun Activities and tagged game, gift, holiday on November 14, 2017 by Janelle Durham. Nice blog. All following steps and tutorials are very helpful. Thanks for sharing unforgettable gifts ideas ever.